Rudimental brought John Newman on stage at Alexander Palace on Friday (16.10.15). The drum and bass quartet surprised the 10,000 strong crowd at the London venue by inviting the 'Love Me Again' hitmaker to join them on their 2012 party hit collaboration 'Feel The Love'. The 25-year-old singer shouted to the thrilled auditorium: "Are you feeling it? 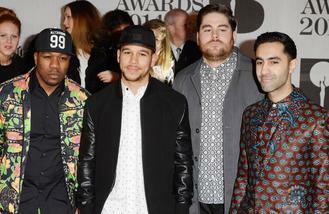 Make some f**king noise for Rudimental!" Earlier in the night the group from Hackey united vocalists Anne-Marie - a former three times world karate champion - and Will Heard on stage for recent hit 'Rumour Mill' from their second studio album 'We The Generation'. Will continued to add his vocals to 'I Will for Love' after which DJ Locksmith addressed the hyped crowd and said: "Thank you for making it (We The Generation) Number One in the UK charts." Singer/songwriter Thomas Jules also commanded the stage and performed synchronised dance steps with Locksmith. Meanwhile, the eclectic group - including Amir Amor on bass and Kesi Dryden who played the drum kit - offered up a taste of their musical roots by closing the night with a mix of dancehall tracks that included 'World A Music', 'You Don't Love Me (No No No)' and 'One Of Those Days' originally sang by Jamaican singers Ini Kamoze, Dawn Penn and Sizzla respectively. However the experimenters added further intrigue by singing Ed Sheeran's fan favourite 'Thinking Out Loud' over the top of the melodies. The night also included opening sets from Izzy Bizu, Max, Kiko Bun and Aba Shanti. Simon Cowell is ''absolutely livid'' after a snippet of One Direction's new single was leaked. Black Sabbath's legendary guitarist Tony Iommi will receive the Gibson Les Paul Award at the 2015 Q Awards. Adele previewed a new song on Sunday (18.10.15). Glastonbury 2016 headliner: Adam Lambert wants Queen to top the Worthy Farm festival. Kwabs performed a sold-out homecoming show in London on Saturday (17.10.15). Markus Feehily "wouldn't have written" Westlife's songs. Train will release their first Christmas album exclusively through Amazon Music. Adam Lambert wants to perform with Queen at Glastonbury. Sam Smith and Ed Sheeran lead the nominations for Song of the Year at the BMI Awards.